Alex nods. "That realm of yours is certainly... Void-y. And the way you destroyed that car was brutal, even if it was only partial power..."
"Professor Deidrich...you wanted to see me?" "Yes Colonel - I've begun the process of developing Elemental tech for our soldiers...it should prove most effective for detaining and eradicating Supers." "Very good....and what of our test subjects?" "The Super DNA we've used in our tests have been ineffective - it always becomes unstable, reverting into a more primitive state. Although...we have had one success." 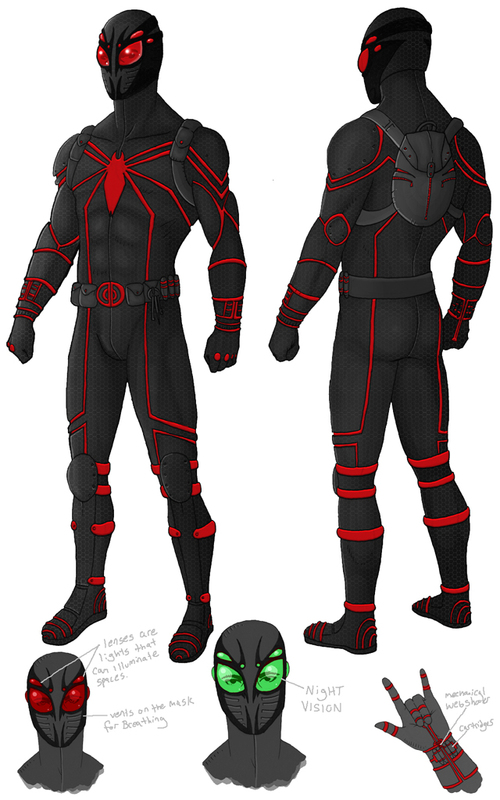 "Justin Michael Elliott, a.k.a Shadow Spider. He was part of the first wave of Supers eradicated, and we've had his DNA on file ever since. However, thanks to our extensive research with Elemental technology, we were finally able to create a perfect hybrid clone of him - a Super with it's powers augmented by Elemental tech..."
"Intriguing....it has no memories from the original, correct?" "Then once you finish perfecting our new Trust Soliders....put that clone at the head of the platoon." Two Trust grunts made their way through a busy hallway, as various other soldiers and workmen passed. They reached an office and entered, saluting quickly and assuming a rigid position. "Commander, Unit 2456 failed in capturing the fugitive known as 'Void.' She was last sighted in INner Genric, but we've lost track of her position." one of the grunts said in a robotic voice. A man dressed in an all-tactical suit sat at a desk on the other end of the room, scanning holographic maps of the city while he listened. "Is that so..? The hologram disappeared as the man sat up. "Was she alone?" "She acquired an accomplice as Unit 2456 attempted to apprehend her. A mutant." The man was silent, and then approached the two officers. "It's possible she may have already left the city. Sweep the city limits, and do not rest till you bring me her head." The officers saluted and left the room, as the man in black sat back down in his desk. He stared out the window, down below at the orderly citizens and officers at their posts. "No Super is going to taint this city...not on my watch..."
Last edited by shadowdelta47 on Sun Jun 17, 2018 2:41 pm, edited 1 time in total. Maya shook her head and chuckled. "Maybe if I were going into a fight, guns blazing." She crossed her arms and observed Void's power, impressed with its' might. After watching for a few solid seconds, Maya took notice of Harris' reluctance to join in the conversation. "What about you? Anything special?" Harris glanced over towards Maya, and lightly smiled. "I would gladly show you my abilities, if it weren't for the complication we are currently in, and with prying eyes who are eager to exploit our weaknesses. For now, it's my little trump card, as ill just stick with guns and tactical knowledge." Harris explained. Void lightly chuckled at Harris "From what I've saw Harris, you might need to use that Trump card sooner than you think." A Yong girl in a black hoodie, dirty blue jeans and gray sneakers watched the group converse in the dark. Her large green eyes and sharp hearing made spying easier. She was afraid to approach, unsure of how they would react. After all, they had to be on edge. As Seraph went to move she knoked a bottle over and froze in place behind an emty potato crate. She hope no one heard her. Clara slowly walked through the ruins of the building she did not know used to be the elemental embassy, carefully stepping over rubble and looking around at the damage. "Well, destroyed building that very few people seem to go to. This is definitely the place to find people who know about resistance cells..." then she noticed the pressure plate. The small thing was a few feet from her, and to anyone else it would have been indistinguishable from the rest of the floor; however Clara had been doing stealth work for almost 15 years now so she noticed it almost subconsciously. "...Or the resistance cell themselves" she muttered, before slinking quickly into the shadows. She knelt down quickly to grab the combat knife from out of the sheath on her leg, a large huntsman knife with a dark crimson paint on the blade. From then on she moved more cautiously, examining each hallway and deftly avoiding any pressure plates as they likely were trapped as IEDs or some similar thing. She got to the elevator, or more aptly the door to the elevator, and looked at the keypad besides it. "Well this ain't where a resistance cell would be, unless this is a really, really advanced and militarised one" she said. She scrutinised the door and key pad, examining for any weakness that would allow her to get inside. Though in this corridor she was annoyingly aware of how visible she was. The Embassy is empty, devoided of value, or reason due to the conflict within Genric and the governing party... It is a sad sight to see, a place where humans, and elementals worked together in attempts to bring peace. Only to have their hopes and dreams torn away in the final days of Genric, and after that... the founding of the Trust. The computers are still online, and functional within the Bunker. As they are displaying a status of the city, which is currently blanked out and a large view screen stating 'Error - 52X95P City Sensor Grid is Offline'. The hard coded data was wiped when the bunker came under attack 40 years ago, any vital data was removed, and any vital equipment was also stripped away. Only a few weapons manage to fall into the Trust hands, which helped in their development in plasma based weapons, and specialized armor... to a limited degree. It is clear that Elemental's still pose a threat to the Trust, but with interstellar communications down, and the Testament being outside radio range of Earth, there is no other option, but to fight it out, find another means to find help like other Super powers (Russia, China, EU), or wait for someone to take note. Void doesn't miss a thing when Seraph knocked the bottle over, her eyes quickly darted over from where the sound originated from. She raised her scythe to blast the potato crate away, but Harris puts a stop to that. "Easy now, this is a civilian area, last thing we need is drawing attention to ourselves... Ill go check it out, how about you stay here Void." He said while pulling the scythe down. Void blinked, and sighed "you take all the fun out of everything, Harris. I wasn't going to hurt it, maybe just put a few void holes in it, as it flails about in pain!" Void exclaimed in protest, before lowering her scythe "fine..." She added. Harris walked over to where the sound came from, and looks at the bottle. He started looking around slowly, and explaining his presence in a calm tone, in hopes that the person would come out. "Hello? Anybody here? You can come out, we won't harm you, as long no harm were to come to us." Harris continued looking around, and quietly sighed "guess Void scared them off" he muttered to himself.